Today, March 30, is World Bipolar Day. This date is doubly significant to me. It is a day of worldwide awareness for this serious and too often debilitating illness. But it is also my personal anniversary date, marking the official beginning of my experience with this illness. My first episode of mania, in 1982, around the same time of year—early spring—cost me my apartment and my car, wrecked my finances, and nearly cost me my job. But the symptoms had seemingly come from nowhere. In fact, they emerged from a set of unusual stresses in my life, many of my own making. Thirty-two years ago, today, I was hospitalized—for the second time in 12 months—with symptoms of mania (the so-called “high” of bipolar disorder). During this hospitalization, which lasted two weeks, I was diagnosed with bipolar disorder and began the standard treatment for it: medication with lithium and ongoing psychotherapy. I am no stranger to mental illness, having suffered depression since childhood. But this bipolar disorder was different, causing me to have hallucinations, delusions that the world was ending, the delusion that I was “special” on a spiritual level, and disruptions in my ability to concentrate on my daily tasks, to sleep, and even to eat. All of the symptoms I experienced were rooted in the core of my being—all of my “normal” beliefs, hopes, dreams, and fears were magnified in my manic state. In the weeks before I was hospitalized, I became obsessed with creating my astrological natal chart. In my “normal” life, I did indeed enjoy dabbling in astrology, on a casual basis. But in this early manic state, I would spend hours drawing and diagramming my Libran traits, trying to make every detail—from the circle I drew using a protractor, to the intersecting lines of my chart, to my very handwriting—Perfect. I also became obsessed with the Pope’s impending visit to the United States for the 1983 Catholic Jubilee. Although I have always been a spiritual person, I am not Catholic. Yet, I saw this rite of the Church as a personal sign of revelation, rebirth, and even “The End Times.” I felt “chosen” and “blessed” beyond normal reasoning. I felt certain that the Rapture was imminent, and I wanted to be in that number. All the while, I was trying to maintain normalcy, going to work each day and trying to do my job. But I was not able to concentrate. My mind would wander into one of my delusional states, and I would just sit at my desk, not working. Fortunately, I had a coworker/friend I could safely confide in. On March 29, 1983, I took her aside and told her I did not feel well and even shared some of the delusional thinking I was experiencing. Somehow, I got through that day. But that night was torturous. After an evening of listening to a favorite religious song, “The Unclouded Day,” by Myrna Summer, I lay in bed all night, staring at the red power button of my stereo system, imagining it to be a signal of impending doom. At first light on March 30, I burst into my brothers’ bedroom, startling them awake and rambling incoherently about my end-of-world delusions. When I saw the cover of their Minnie Riperton album, Minnie, which was tacked to the wall, I saw not simply an album cover, but an omen of evil and death. On the cover of this, her final album, Minnie Riperton was dressed all in black. And in her back-cover photo—which was also displayed on the wall, she posed in an almost blackbird-like position. At that point, I began screaming and yelling at my brothers about the evil photo. My parents intervened, calmed me down some, notified my doctor, and drove me to the hospital. As we rode to the hospital, which like many was associated with a university, I was inexplicably certain that I was about to enter medical school—not a psychiatric ward. This delusion persisted through my admission process. Briefly, I was placed in an isolation room, because I was so lost in my various delusions, hallucinations, and fears. I’m pretty sure I was given antipsychotic medication to help stabilize me enough to acclimate into the ward, which housed both men and women. I was assigned a private room in the ward, and I went about getting to know the other patients on the ward. I mistook two of the residents for my heroes, Robert F. Kennedy and Martin Luther King, Jr. We sat in the day room playing cards and talking until it was time for bed. The ward had a strict schedule of sleep times, meals, individual therapy, group therapy, and art therapy. There was enough staff to monitor all patients, and in fact, there were two nurses assigned to my case. Over the course of the two weeks, I learned a great deal about the disorder, details both great and small. I was able to keep a journal, although most of it was just “word salads,” nonsensical strings of words, written in tiny letters—micro-writing was another symptom of the disease. But I did manage to write one or two decent poems that gave my family an inkling of what was going on in my mind. I drew pictures depicting my fragile state of mind—rainbows and crosses and Stars of David all meshed together. It was, after all, Holy Week—as it is this week. And I was still consumed with the spirit of the season. I hated the hospital food; it smelled funny to me, and I was afraid I was being poisoned. Eventually, I was able to stomach it. As symptoms began to improve, patients were allowed to leave the ward to go on walks during the day, and after the first week, I was allowed a weekend visit home. My dear grandmother urged me to “pull myself together.” For the first time—but certainly not the last—I had to explain to her that this was an illness. Like diabetes or cancer. There was no amount of self-will that could heal me. One of the things that did contribute to my healing was music. There was a small chapel on the ward with an organ, and I would go in and play it for awhile—mainly, one of my favorite Lenten hymns (“What Wondrous Love Is This”). And several of us brought our guitars onto the ward, and we would have sing-alongs of rock and folk music we all knew. But the main task was relearning to think and act normally again, and to learn how to deal with moods, energy, diet, and sleep needs, to help prevent or assuage the return of symptoms. Returning to work after the hospitalization was difficult; I was able to work half-days for a brief time, allowing me to adjust to the rigors and stresses of daily living. In time, I got over the shame and sense of failure of being mentally ill. But I largely kept it to myself. Only my supervisor and a few very close, trusted friends knew what I had really been through. And in time, I was able to reap the benefits of being bipolar. It balanced out my proclivity for depression, allowing me to be more assertive, more confident, and more successful in my life. In fact, after this last manic attack, I never had another one; only occasional depressions, for which antidepressant medication was added to the lithium. But a year ago, I learned that I had developed chronic kidney disease because of my long-term use of lithium. Having watched my father grow sick and die of the same disease (exacerbated by his long-term use of NSAIDs for arthritic pain, as well as diabetes and associated illnesses), I decided to stop using lithium. In this past year, free from the fog of lithium, which dulls the senses, leaving you feeling slightly dopey, overweight, and susceptible to hypothyroidism and other unintended consequences, I have finally discovered the true me: a person who thinks and feels deeply, loves to laugh, still loves to sing and play music, and is more passionate about writing. 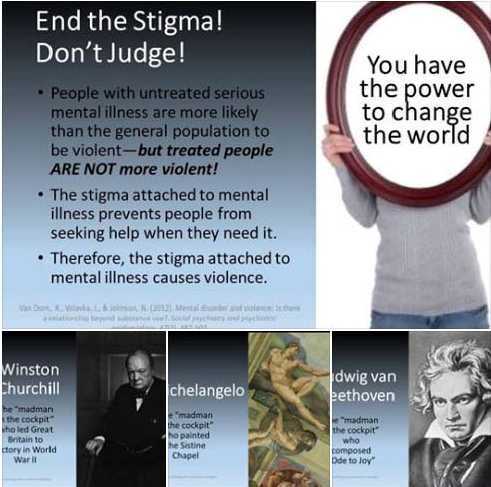 Best of all, I am not stigmatized by my illness any more. It is a part of me, but it does not define me. And it has enabled me to be more forthright, honest, and free. Thanks Jackie for sharing your story with the world and enlightening us on this illness.#endstigma! You write about mental illness the way it needs to be written–show and tell the reader your story without a hint of self-pity, with insight into its brilliance and darkness. I feel similarly about myself now that I’m open and unashamed of my illness. Freedom. Feeling deeply about everything. Finding myself. Thank you for sharing your unique experience and perspective of Bi-Polar Disorder. Fascinating how you find it balances your depressive episodes. What I loved about your piece is how “dispassionately” personal it was. The details of your family and the interpersonal dynamics involved in your journey through the illness took my breath away. You wrote in such a masterful, literary way—from the inside out. What’s fascinating to me is that we essentially reached the same conclusion via somewhat different paths. I look forward to reading more of your work. Wow…just, wow. That’s the nicest compliment on my writing I’ve ever received. I’m blown away. I still think about your retelling of manic episodes and it makes me realize that even within the “community” of those with mental illness, we can only understand so much of what others experience. I still feel more at peace with fellow sufferers. We know enough.